This is cool. People getting all creative and lighting their homes for the holiday season. 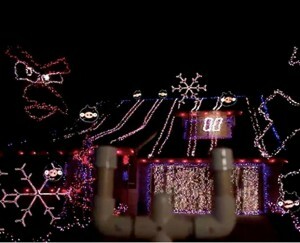 How about the angry birds holiday lights display? The Angry Birds craze is still going strong, so much so that Ric Turner, a former Disney Imagineer, created a playable version of the game on his house using Christmas lights. This year’s show runs on two computers and ten Light-o-rama 16-channel controllers. Audio for the game is broadcast on a radio station, 99.1FM, and even includes a game controller that’s cord is long enough for visitors to play in their cars when driving up for a peek. This house-sized version of the game uses 20,000 lights, but is more energy efficient than one would think. It uses less than one cent of electricity per game. Check out the video below for the full experience.